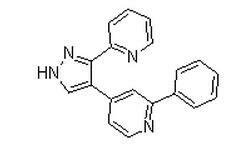 Remarks:GW6604 is a potent and selective ALK-5 inhibitor with potent anticancer activity. GW6604 is also a TGF-beta signaling pathway inhibitor. In vitro, GW6604 inhibited autophosphorylation of ALK5 with an IC(50) of 140 nM and in a cellular assay inhibited TGF-beta-induced transcription of PAI-1 (IC(50): 500 nM). In vivo, GW6604 (40 mg kg(-1) p.o.) increased liver regeneration in TGF-beta-overexpressing mice, which had undergone partial hepatectomy. In an acute model of liver disease, GW6604 reduced by 80% the expression of collagen IA1. Inhibition of ALK5 could be an attractive new approach to treatment of liver fibrotic diseases by both preventing matrix deposition and promoting hepatocyte regeneration.